This is a thickly textured, warm, comfy & cozy cap with the look of knitted ribbing that you’ll enjoy making and wearing. Make one in your favorite colors, or make several – one for every member of the family. 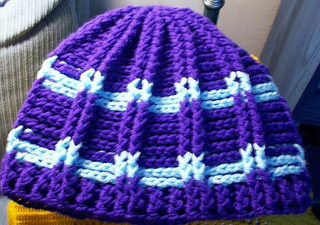 By using a thinner yarn with a smaller hook, you can make these caps to fit children and babies too. Intermediate – you will be making front post and back post double crochet stitches, and joining in such a way as to avoid a noticeable join or a spiral effect. edge. To accommodate a larger size head, use a J hook.